A wall mounted coat rack has replaced the free standing coat rack. As homes are getting smaller, the need for wall-mounted items is more crucial, which is why most people are kicking free standing ones to the curb. However, if you don’t choose the correct wall rack, they can be equally as inconvenient as the one you leave on the ground. You need to take into consideration the weight capacity of the hooks, the durability of the material, the mounting hardware, and even the price tag. If you purchase a coat rack by liking the design, you may find yourself faced with damaged walls and hooks that fall off. Remember, not every coat rack is made to last the distance. Check out these nine high quality designs below, then learn what it takes to purchase the best wall mounted coat rack for your money. If you are looking for a wall-mounted coat rack that’s tidy, sleek, stylish, yet doesn’t break the bank, then set your sights on this one. Produced by AmazonBasics, it’s a high-quality and versatile wall-mounted coat rack that will be suitable for all manner of items. Whether you want to hang up keys, jackets, dog leashes or even other clothing, it will more than meet the mark. However, its hanging capabilities is not all it has going for it. Its design is also a standout feature. When you look at this coat rack as a valid option, you will enjoy getting to choose from four colors. Depending on your home décor, light walnut, black, white, or barn wood will all work beautifully in your home. What’s more, with stamped metal hooks and wood backing, it adds a touch of character and charm at the same time. This wall-mounted coat rack offers a five-pound capacity for each hook, which means it’s capable of holding all manner of heavy jackets. It also comes with full hardware and instructions and is a generous size of over 22 inches long. Whether you need a coat rack for your entrance, the laundry, or somewhere else in your home, this affordable option from AmazonBasics could be all you require. If you want to be able to hang your jackets, bags, and other items up and out of sight, then it might be time to select this Liberty wall-mounted coat rack and make a difference to your home. There is nothing more frustrating than clutter throughout your house. When the kids take off their bags and put them on the floor, or they hang their jackets and sweaters over chairs, it’s time to act. Fortunately, a wall mounted coat rack such as this one from Liberty can help with your clutter problems. Thanks to its five hooks, 27-inch length and a generous weight capacity of 35 pounds, you can hang school bags, sweaters, jackets, keys, and more, out of sight and out of mind. What’s more, you can do so in style. When you look at this wall mounted coat rack, you will find that the four options available make it challenging to select the one you like the most. Opt for white and satin nickel, flat white with satin nickel, black with satin nickel, and white. Whichever wall mounted coat rack you select, you will be pleased it’s from Liberty. The hooks offer three-and-a-half-inch projection, are tri-hooks, and feature zinc die-cast. As a result, they are more than suitable for most home hanging requirements. Don’t waste time cleaning up after the kids anymore. Invest in a wall mounted coat rack and put it to good use. Adding rustic charm to your home with a wall mounted coat rack can accentuate any area of your home with little effort. And, when you buy this coat rack from Avignon, you benefit from not only that rustic charm most people love and adore but a functional rack as well. You can use it for your keys, jackets, bags, and more. With strong and hand-forged solid pine, this wall mounted coat rack is taking the market by storm. More people see the benefits of hand-crafted goods, and a coat rack is an excellent place to begin. It features deceivingly lovely hooks which are heavy-duty and robust, as well as being 38 inches long to fit more items on it. While it doesn’t have the sleek and contemporary styling of other wall mounted coat racks on the market, that’s not its intention. Instead, it aims to add a touch of character and whimsical delight to any home in which you install it. If you want that charm for yourself, consider purchasing it for the affordable price tag and making it a feature point in your home. If you look at all the wall mounted coat rack options online, you will find that most of them are wood. While there is nothing wrong with wood, it doesn’t always tie into your home’s overall décor. And, why would you buy something for your home that doesn’t match? Rather than make a poor purchasing decision, you can buy this stainless-steel wall mounted coat rack from OUNONA. With not a wood feature in sight, it’s suitable for all manner of homeowners looking to retain that sleek and classy elegance strongly featured in their home. It features high-quality, rust-free stainless steel, won’t snag your clothes on the six or ten hooks, and comes with the hardware and installation instructions as well. What’s more, given its generous 17-inch length, it’s more than suitable for use as a towel hook, in your laundry, or as a wall mounted coat rack in your entrance. This wall mounted coat rack is sleek, contemporary, easy-care, and striking in design. If it ticks all the boxes for your family home, then it might be time to add it to your shopping cart immediately. If you want to use the same hooks throughout your home with none looking out of place, then set your sights on this wall mounted coat rack from Turefans. When you purchase this rack online, you benefit from two packs of wall mounted coat hooks, 15 hooks in total, and a premium product that will impress time and time again. If you are looking to kit out your entire home, then you can even select a six pack, or stick with the two or four-pack options as well. Then, if you prefer the black finish over the reflective chrome mirror look, then you can get that too. Turefans is all about providing you with options. What’s more, you don’t need to use this wall mounted coat rack for coats at all. Instead, you can use them for towels in your bathroom, for kitchen utensils, and so much more. The robust and easy-care stainless steel coupled with the sturdy hooks ensure that it’s suitable for whatever you need it to hold. And, when you go to mount it on the wall, you will find the instructions are easy to follow, and the hardware comes with it. However, you may wish to switch to some more robust anchors as they may not be suitable for the purpose. 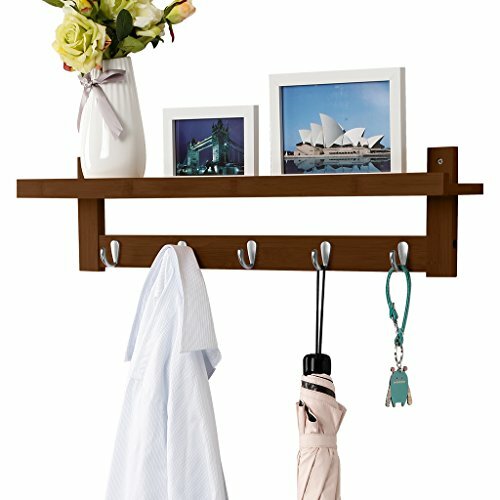 If you are looking for a versatile wall mounted coat rack that will look equally as inviting in your laundry as it does your entrance, then set your sights on this one from Turefans. Rather than drape your coats over the arm of your chair, why not invest in a quality wall mounted coat rack? Stop cluttering your home with school bags, keys, and jackets and use a coat hook. This antique-style wall mounted coat rack will capture your attention for many reasons. Firstly, you can select either two, four, or six hooks on your rack. Depending on what you want to use it for, this can be a convenient addition. Then, you can either choose white, walnut, or Mediterranean blue coloring. Depending on where you plan to place it in your home, and your property’s unique décor, either option may accentuate parts of your home. However, the benefits don’t end there. The unique brass hooks coupled with the natural pine and one-of-a-kind paint mix and style means you are bound to fall in love with everything this wall mounted coat rack has to offer. What’s more, given its generous 27-inch length, it’s also suitable for the whole family’s coats in your entrance. Make a change to your property’s clutter today by investing in a coat rack that immediately takes care of the problem. If sleek and stylish is more your style, then including a stainless-steel wall mounted coat rack in your home could be a good option. This one, with its premium 304-grade stainless steel and smooth finish, will more than meet the mark for quality and style in your home. Whether you use it for kitchen utensils, towels in the bathroom, or keys and jackets in your entrance, it’s going to impress time and time again. Unlike wood wall mounted coat racks which may split and break over time, this rack keeps chugging along nicely. It comes with six heavy-duty and snag-free hooks, as well as a range of mounting hardware to make sure installation is effortless. What’s more, it won’t rust, is easy to care for, and has three mounting holes on the back. No matter where you choose to put this wall-mounted coat rack, it will look the part every time. Rather than ruin your sleek and stylish “look” in your home with a wood rack, keep the style flowing with this stainless-steel option from Homfa. 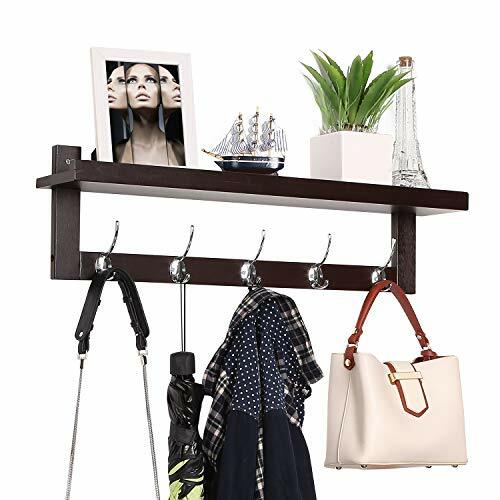 If you don’t have a lot of space or you’re tired of continually snagging yourself and items on coat hooks, then set your sights on this wall mounted coat rack. While it looks like it’s from the future, it’s here now and is ready to take your coat hanging requirements to the next level. 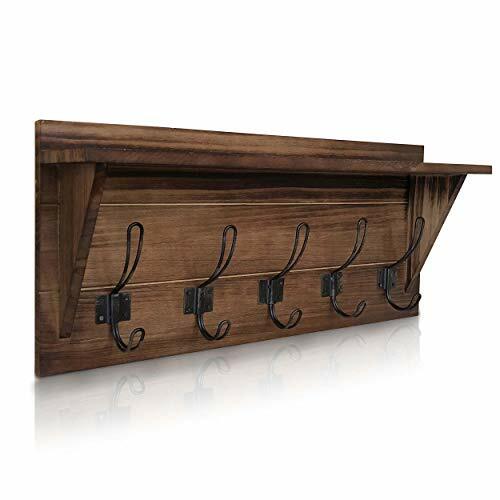 While most wall mounted coat racks have fixed hooks that stand out around three inches, this rack doesn’t. Instead, all hooks can retract back into the 20-inch board when they are not in use. What’s more, the style options are exceptional – making sure you can select a style to suit your unique home décor. Opt for three, five, or eight hooks, then choose a color of either espresso, walnut, white, natural, or nickel. All hardware for installation and instructions come with it, and the final finished size is 20 x 1.5 x 2.75 inches. Everything about this wall-mounted coat rack will impress, and it meets the mark in so many ways. 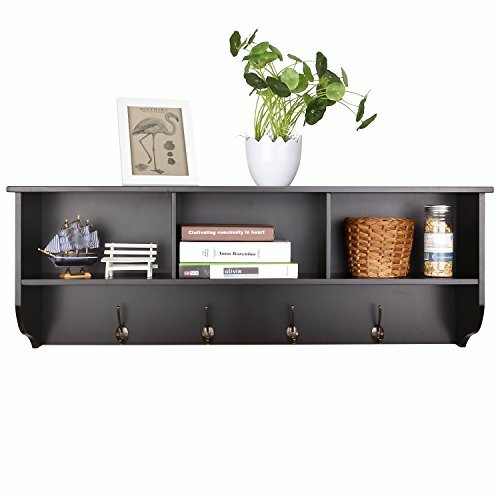 This rack will be unlike anything you’ve ever seen so why not make it a focal point in your home? There is no denying that owning a wall mounted coat rack is convenient. After all, it gives you somewhere to hang your keys and jacket when you get home from work or school. However, when you aren’t using them, they stick out like a sore thumb with large, ugly hooks that are ready to snag you every time you walk past. Fortunately, Umbra has solved the problem by producing a multi-hook coat rack that doubles as art when you aren’t using it. With a “stick-like” style, it’s aesthetically pleasing to the eye, while accentuating contemporary styling in any home. Then, when you come home and need somewhere to put your jacket, you can pull one of the five pull-down hooks and put it to good use. It goes from a lovely piece of art to a convenient fixture in no time. You can buy it in either black, brown, or white to suit your home, as well as arriving with instructions and hardware for installation as well. 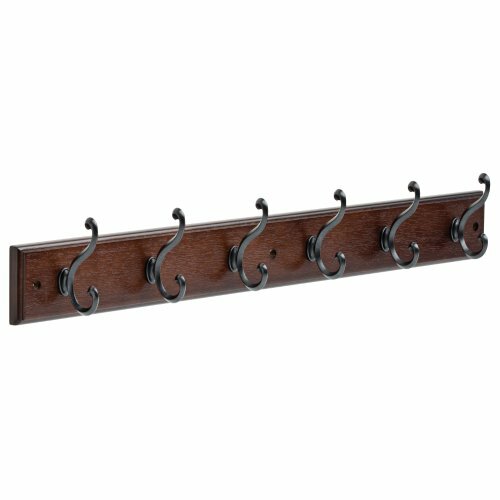 This 19.-5inch multi-hook coat rack is sure to impress. Putting holes in your fresh, new, and untouched walls is always a time of stress. It’s even more so if you find yourself purchasing a substandard wall-mounted coat rack, then having to buy a second one once it breaks. Then, you have two sets of holes in the wall as opposed to one. Rather than make a poor purchasing decision in the first place, why not do your homework to make sure you know what you need? Running through a mental checklist before you hit the ‘buy now’ button can save a lot of grief – and wall damage – further down the line. Consider these points below. The size of a wall-mounted coat rack counts for a lot because it needs to be able to cater to your family’s needs. If you only have a couple of people in your home, then a smaller coat rack is okay, but if you are a part of a family, a five or six-hook coat rack is going to be more suitable. Even if you like the style of a rack you see online, make sure you pay attention to the hooks. Do they appear sturdy? What is the weight capacity? What do other people say about them? The best hooks on a wall-mounted coat rack are those that can handle the weight of a winter jacket, a child’s backpack, and other heavy items. Unfortunately, it doesn’t matter how much you spend on a wall-mounted coat rack; sometimes you end up with poor mounting hardware. Rather than risk using anchors that aren’t strong, or screws that aren’t long enough, you may have to have a new set of installation hardware on hand. Pay attention to what others in the review are saying. If you like the rack enough to put up with terrible hardware coming with it, make sure you have better screws and anchors set aside. The type of material your coat rack consists of is often down to personal preference. Contemporary homes usually like the simplistic and sleek elegance of stainless steel, while older homes may look better with charming and rustic wood. With stainless steel, be careful of using it around moisture such as in bathrooms.